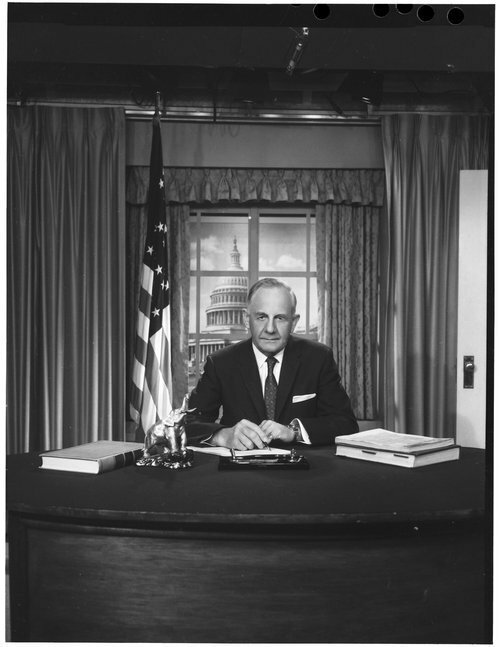 A photograph of Frank Carlson, United States Senator from Kansas, seated at his desk with the nation's capitol in the background. Born in 1893 near Concordia, Kansas, Carlson attended public schools and Kansas State University before serving in World War I. After the war, he returned to Concordia to farm. Carlson, a Republican, had a long and successful political career serving in the Kansas Legislature 1929-1931 and United States House of Representatives 1935-1947. In 1946, he was elected governor of Kansas and left office on November 28, 1950, when he was elected United States Senator. Carlson served in the United States Senate from 1950-1969.